The IfM was set up to be a place where research meets practice – and where industrial collaboration continues to underpin everything we do. Creating effective business tools is therefore a fundamental part of who we are and what we do. As well as developing a set of tools and approaches that can be used in specific situations we also have a set of flexible tools that can used in a wide variety of circumstances, either individually or together. These are just some of the tools we have developed and which are being widely used in organisations of all shapes and sizes. Strategic roadmapping: the IfM has established itself as a centre of excellence for research into roadmapping. The techniques we use are being continuously explored and improved both through research and through practical application. 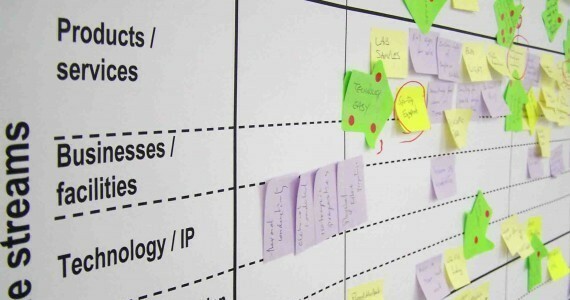 A related area of research is around developing effective visual outputs from roadmapping and other management tools. Organising and communicating very complex information in a way that allows people within - and sometimes beyond - the company to understand it is a vital part of the process. Make or buy is a fundamental question for many manufacturing and technology companies and our approach has been used in a wide variety of sectors. All companies need to measure their performance but taking a strategic approach to setting your performance measurements is key.